I always had a passion for transportation, whether it was learning signal timings or watching lane merges. Bicycle and pedestrian design became a strong extension of that passion. Individuals should feel comfortable and safe, no matter what mode of transportation they decide to take. So, one corridor at a time, I strive to make it safe to travel, whether you're in a car, on a bike, or just walking your dog. Lindsay brings traffic and civil engineering experience to the Alta team including traffic analysis, ADA compliance, safety measures, and project evaluation. Her project management history includes public involvement measures, transportation planning, and trail design. She completed her master’s degree in urban and regional planning with study focuses in bike and pedestrian planning and urban transportation planning. The integration of her engineering and planning experience helps her to develop innovative concepts when planning and designing pedestrian enhancements and bicycle facilities. 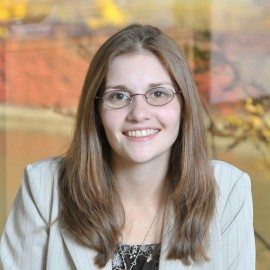 Lindsay received her bachelors in Civil Engineering from Rensselaer Polytechnic Institute and her Masters in Urban and Regional Planning from SUNY Albany.